The frenzy of price-cutting continues at Fraser Yachts as I learn that Josh Gulbranson and Michael Selter have seen a further $190,000 price cut on their joint listing, the 31.39m motor yacht Trilogy. Trilogy has also had continuous mechanical upgrades since 2008 – her engines and generators have been rebuilt, running gear and steering system updated, and most pumps replaced. 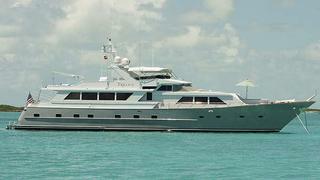 Her contemporary interior can accommodate six guests in three staterooms. Available to view in Fort Lauderdale, the price of Trilogy is down from $1,585,000 to $1,395,000.